Igor Fyodorovich Stravinsky (Rọ́síà: Игорь Фёдорович Стравинский, Igor' Fjodorovič Stravinskij) (17 June [O.S. 5 June] 1882 – 6 April 1971) je olukosinupo orin, ateduuru, ati adari orin omo ile Russia, o je didamo gege bi ikan ninu olukosinupo orin ti o nipa julo ninu orin ni odunrun ikejilewa, 20ji. ↑ Page 2006; Théodore and Denise Stravinsky 2004, vii. Stravinsky, Igor. 1936. Chronicle of My Life. London: Gollancz. Reprinted as An Autobiography (1903–1934). London: Marion Boyars, 1990. ISBN 0-7145-1082-3. Reprinted, New York: W. W. Norton & Co., 1998. ISBN 0-393-31856-7. Cross, Jonathan (1999). The Stravinsky Legacy. Cambridge: Cambridge University Press. ISBN 9780521563659. Joseph, Charles M. (2001). Stravinsky Inside Out. New Haven: Yale University Press. ISBN 0300075375. Kundera, Milan; Asher, Linda (translator) (1995). Testaments Betrayed: An Essay in Nine Parts. New York: HarperCollins. ISBN 0060171456. Kuster, Andrew T. (2005). Stravinsky's Topology (Univ. of Colorado, Boulder D.M.A. Dissertation ed.). Morrisville, NC: Lulu.com. ISBN 1411664582. 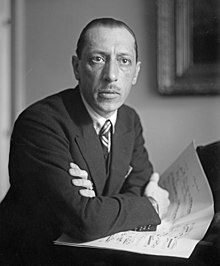 Stravinsky, Igor (1947). Poetics of Music in the Form of Six Lessons. Cambridge, MA: Harvard University Press. OCLC 155726113. White, Eric Walter (1979). Stravinsky: The Composer and His Works (Second edition ed.). Berkeley and Los Angeles: University of California Press. ISBN 0520039831. Wallace, Helen (2007). Boosey & Hawkes, The Publishing Story. London: Boosey & Hawkes Music Ltd. ISBN 9780851625140. Àtunṣe ojúewé yi gbẹ̀yìn wáyé ni ọjọ́ 11 Oṣù Kẹta 2013, ni ago 11:28.